The electro-mechanical Puma chain saw is powerful, light, extremely fast and noiseless. It can be used either hand-held or assembled on one of its special extension poles (fixed: 170 cm – telescopic: either 140-200 cm or 180-240 cm). It can prune any kind of plant. Now available with an 8″ bar and ¼” chain, automatically lubricated by means of a membrane pump. When, for example, the operator applies too much pressure while cutting, the chain speed decreases, and the red light flashes. 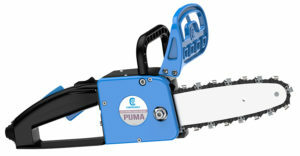 Having been notified, the operator can decrease the pressure until the light turns green again, allowing full speed of the chain to finish the cut.